Dubai, United Arab Emirates – 30 July, 2018: Huawei Consumer Business Group (CBG) latest HUAWEI nova 3 is now available in stores across the UAE. The global smartphone giant yet again impresses its customers with its third-generation intelligent device embodying elegance and incredible features as the device received a record number of pre-bookings ahead of its launch. The HUAWEI nova 3 is receiving phenomenal response from customers as they are eager to get their hands on the innovative device for an Artificial Intelligence (AI) selfie experience. “HUAWEI nova 3 has just hit the shelves and we are absolutely thrilled with the response. The HUAWEI nova series is a popular series in the UAE and we have been focusing on further enriching our nova portfolio and offer today’s diverse customers a variety of products and features to choose from. Earlier this year, HUAWEI nova 3e became a top seller in it segment in no time as it offered consumers more than they imagined possible in its category. Therefore, we now bring newer devices to nova 3 series powered by AI in its camera features to offer users the best-in-technology ‘selfie’ that a smartphone can offer”, said David Wang, UAE Country Manager, Huawei Consumer Business Group. HUAWEI nova 3 and HUAWEI nova 3i feature a revolutionary 24MP + 2MP dual front camera that is designed to provide an unprecedented AI Selfie experience. 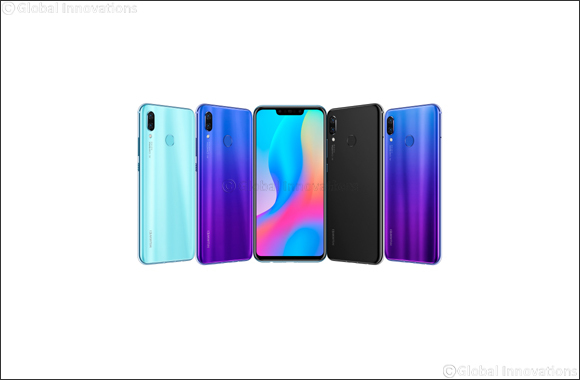 The AI camera capabilities of HUAWEI nova 3 and HUAWEI nova 3i enable them to recognize more than 200 different scenarios across eight categories, including Blue Sky, Plant and Beach, and apply a unique set of optimizations for each scene to create an enhanced shots that take selfies to another level, and actually this is the novelty in this recently launched nova 3 series, as its predecessor HUAWEI nova 3e that was available earlier this year in the UAE; comes with 16MP front camera and packs smart photography features such as natural beauty algorithms that are designed to accentuate each person's natural beauty. As the sought-after innovative smartphone hit stores in the UAE, Huawei offered its customers a chance to win one HUAWEI nova 3 every hour on the first day of its sale in the Huawei Experience Store in The Dubai Mall. Chatter, excitement and AI selfies set the tone for the day as customers were excited to both experience the smartphone and buy it. “This incredible customer response is a testimony to the brilliance of this device that offers phenomenal features to capture AI super selfies. It is clear from this first response that our forecast of HUAWEI nova 3 being a top seller in this smartphone category is set to come true earlier than anticipated”, added Wang. HUAWEI nova 3 runs on Huawei flagship Kirin 970 with up to 4GB RAM memory and the newest EMUI 8.2 to offer a flagship-class experience to users and HUAWEI nova 3i is equipped with a Kirin 710 AI processor and EMUI 8.2 for flagship performance. In pursuit of the best AI selfie camera, HUAWEI has equipped the HUAWEI nova 3 with a 24 MP + 2 MP on the front and 24 MP + 16 MP rear dual cameras, creating a quad-camera powerhouse that breaks ground for new smartphone experience. Huawei understands the evolving camera needs of today’s generation and every feature of HUAWEI nova 3 is crafted to deliver a smartphone photography experience as effortless and joyful as possible. As the AI camera of HUAWEI nova 3 series is capable of identifying human subjects, and applying the correct beautification solutions as well as the right camera settings to capture that flawless and confidence boosting selfies in one click, and most importantly simplifying the user experience as the AI “does the job” for the consumer. The HUAWEI nova 3 is available at the HUAWEI Experience Store located at The Dubai Mall and across select retailers in the UAE in Iris Purple, Airy Blue and Black colours at price of AED 1,799. In addition, the HUAWEI nova 3i will also be available for pre-order from 7th August and will be on the shelf from 16th August at the HUAWEI Experience Store at the Dubai Mall and across select retailers in the UAE. The HUAWEI nova 3i will be available in Iris Purple, Pearl White and Black colours at AED 1,299. HUAWEI nova 3 Series has 12 months manufacturer warranty and a VIP dedicated Hotline Service, door to door device collection-repair-return and free engraving services available at all Huawei Service centres across the UAE. Additionally, customers can buy HUAWEI nova 3 series under old to new trade-in offer at Huawei Service Centres and select independent retailers across UAE. Pre-installed HiCare Service Application available for fingertips solutions.